Recently many of us were able to enjoy the amazing exhibit at the National Gallery of Victoria (NGV) on the ‘Making of the Australian Quilt’. The exhibit featured numerous quilts that are normally housed at the National Gallery of Australia (NGA), and are shown rarely due to their delicate nature. The works shown were from the timeframe 1800 to 1950, and would, on the surface, not seem to have much to offer the modern quilter. But far from it! So many of the works were modern, exciting and engaging. As I made my way around the displays, I found myself making copious notes on the quilts, the colours, and the use of fabrics (#quiltnerd). Many of our foremothers were true proponents of the scrap quilt, where bits and pieces of all types of fabric were employed. One of the most obvious displays of scrappiness in action is the quilt that graces the cover of the excellent compendium. 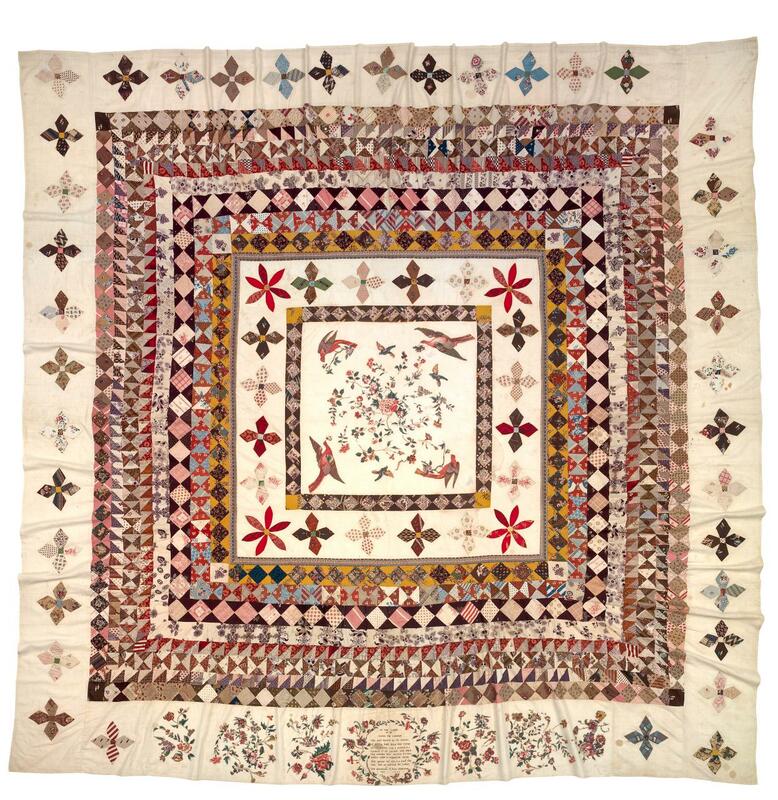 This quilt, entitled rather fittingly as “Crazy Quilt”, features a myriad of small scraps of fabric, many thought to be samples from the maker’s husbands place of work. They are delightfully constructed as half-rectangle triangles, using a zig-zag type hand stitch. The rectangles have been made into long columns of colour and joined to give an exquisite result. 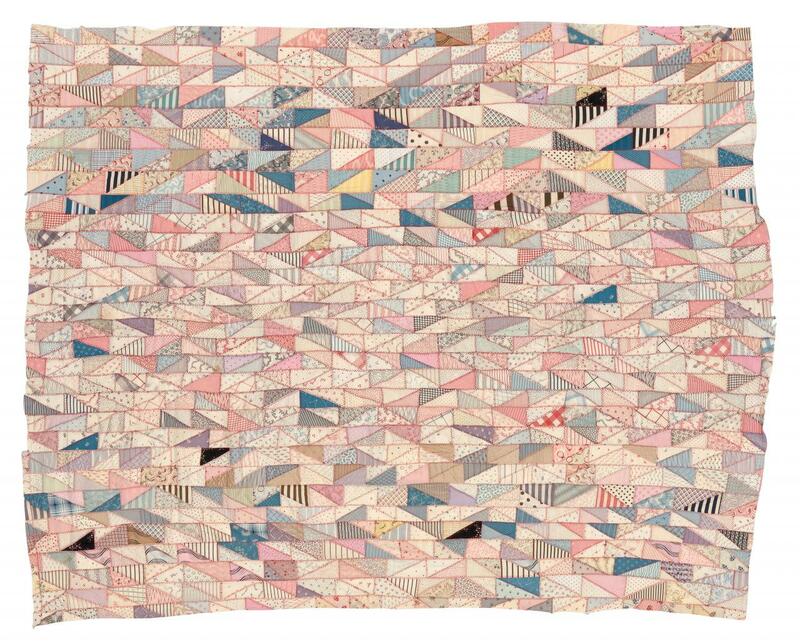 In fact, many of these crazy quilts, could easily be considered as part of the modern movement of “made fabric”. Some notable things about many of these quilts, especially those that took my fancy, was the relationship to modern quilting. Many quilts were not sashed, bordered or laid out in regimented grids. Binding seems to be a relatively new thing, as many were not bound, and were often bagged out, if finished at all (in these examples). Actual quilting was not the dense, tight stitches that are associated with show quality quilts. The quilts were quilted enough to hold them together and make them useful items. Another delightful aspect is the raw nature of the work. There aren’t sharp points, or precise seams. There aren’t row upon row of matching colour schemes and carefully curated fabrics. They are REAL quilts made to commemorate something, or simply, to be used. In some instances, the quilts seem to have been made to pass the time! Rather like the famous women of Gee’s Bend, creativity was borne out of a need to make something useful, when the wagga was sewn into being. The wagga, a quilt made ostensibly from little more than wheat sacks to provide warmth in the bush setting. But what started out as necessity, began to take on more artistic intent as the wagga began to incorporate other fabrics. The overall structure was still simple, and did not conform to the traditional medallion design, as was common from British quilt-making. 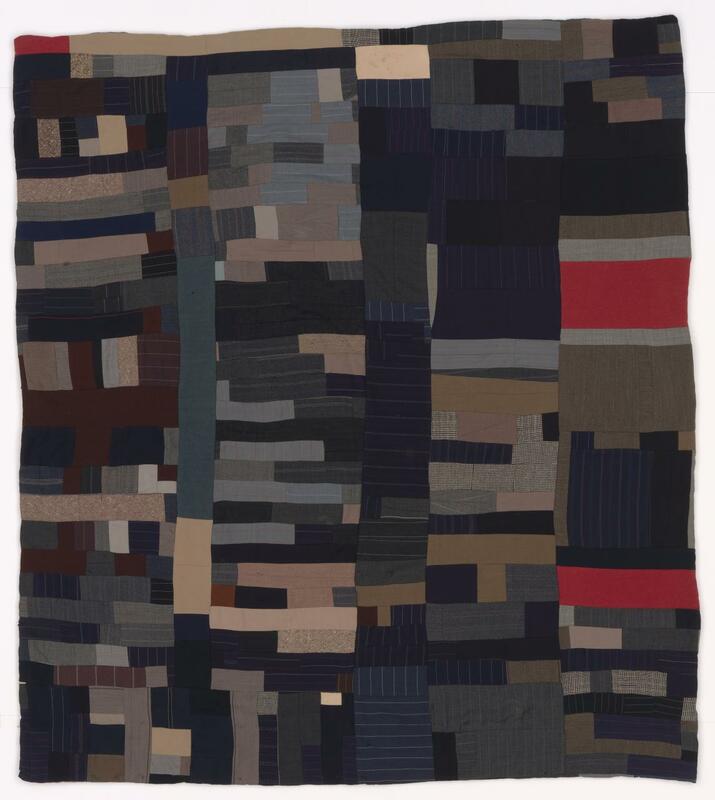 Suiting samples, dress fabrics, and wool scraps, often salvaged from factory floors, were transformed into useful and beautiful quilts, that were no longer just the domain of the bushman. The “Medallion Depression Quilt” by Chignall, is one such quilt which uses scraps, but shows them to their best effect with a simple design. It is based upon the medallion ideal, but with a central rectangle and bright solid colours throughout. I wish it were possible to see the colours in these quilts as they were originally. Time and adverse conditions have damaged many, and lost the vividness of the colour that was surely present. I was also present at a guest speaker’s talk on the “Rajah Quilt”. The quilt is a significant item in not only our history as quilters, but as Australian women. Information on the history of the quilt, including details about it’s incredible tale of a voyage, and then it’s subsequent loss, and then discovery (in an attic in Scotland no less! ), can be found at http://nga.gov.au/RajahQuilt . There a numerous websites and books on this exciting part of our history. The guest speaker on this occasion, was an historian, but notably not a quilter. It was interesting to hear their interpretations on the quilt and the backgrounds on the makers of the quilt. They studied the manifest of the ship, and found that a very small proportion of the women aboard the ship identified as seamstresses prior to boarding. Despite their background, the women were charged with assembling a quilt from a selection of supplied fabrics. The historians surmised that the makers of the quilt must have been novice sewers, due to the number of blood spots from finger pricks over the quilt. Despite having sewn for nearly 40 years, I must still be a novice by this definition – as I don’t think I have made a quilt yet that doesn’t have my blood somewhere on it! Finding definitive information on the lost history of the quilt, and the contributors to its making, is difficult and full of dead-ends. Our history and identity as quilter’s began with these amazing women, making a quilt, with limited equipment and skill, a swaying ship, and dark conditions. These beautiful works are rarely on show, due to their fragility and sensitivity. I am sure all of us who got to see these historical works, were able to appreciate where we have come from, and where get to take quilting in the future.